04:30… alarm chirps…. I had been invited by Bailey of Bristol to their launch of the Pegasus Grande and this meant a bit of an early start. By 05:15 the Amarok was idling warming up and the Sat Nav silently contemplating my route down to Swindon, while I finished making a coffee in the Camelback insulated mug, cleaned the heavy dew off the windows and threw my day bag into the truck. Unfortunately it was going to be a solo trip. The 167 mile trip took in the stunning vistas of road works on the M6 and M5 as far down as Gloucester via Birmingham, which tends to be more road works than motorway most of the year. Happily, leaving early meant a not to shabby arrival time of 08:40 and give me chance to have an early wander round and take a few photos while it was quiet. Bailey had brought all six of the new Pegasus Grande range – four twin axles and two single’s. All six were designed from the ground up to take advantage of being constructed on the 8 feet wide (2.450m) platform. One of the first things I tend to look at is what does it weigh in at? Being 8 foot wide the initial expectation is “Ohhh… that’s going to be heavy” Well I was quite surprised at the weight savings that have been made across the range. 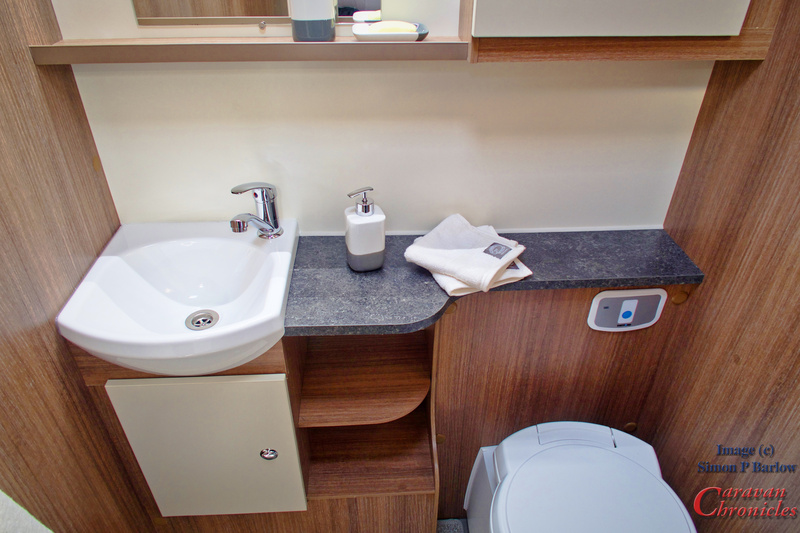 The heaviest out of the six is not surprisingly the twin axle Grande Palermo 6 berth with twin bunks at the rear. However with a MRO of 1531Kgs and MTPLM of 1692Kgs giving a useful payload of 179Kgs. The lightest is the four birth single axle Brindisi weigh in with a MRO of 1335Kgs and MTPLM of 1490Kgs allowing 155Kgs of payload. The two single axle caravans have been built on ALKO 1600Kgs chassis and the four twin axle use 1800Kgs chassis, so there is an option to upgrade the plated weights if desired. The single axle units have a shipping length of 24’3″ (7.381m) and the twin axle 25’10” (7.863m). One of the big talking points is the new “G” shape lounge layouts. 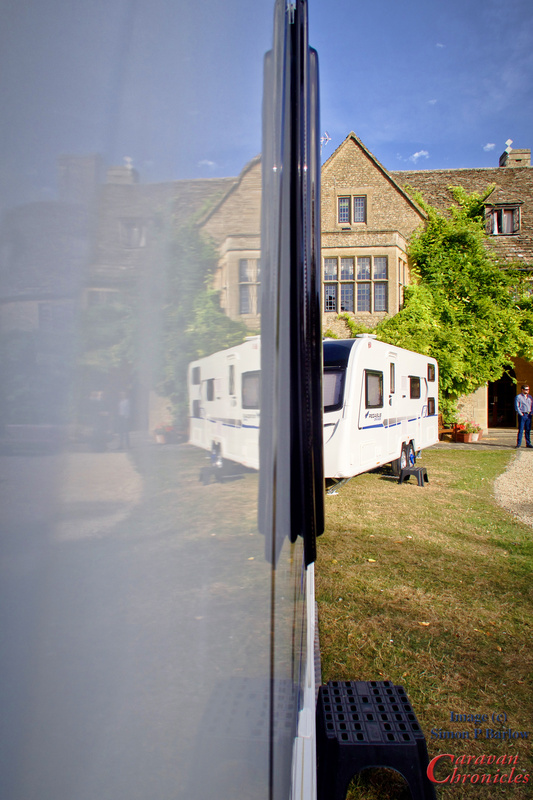 Having a wider caravan and almost a ‘blank’ canvas allows the designers to play around with layouts. The new lounge design can be found in four of the Pegasus Grande range. (photos courtesy of Bailey)…. 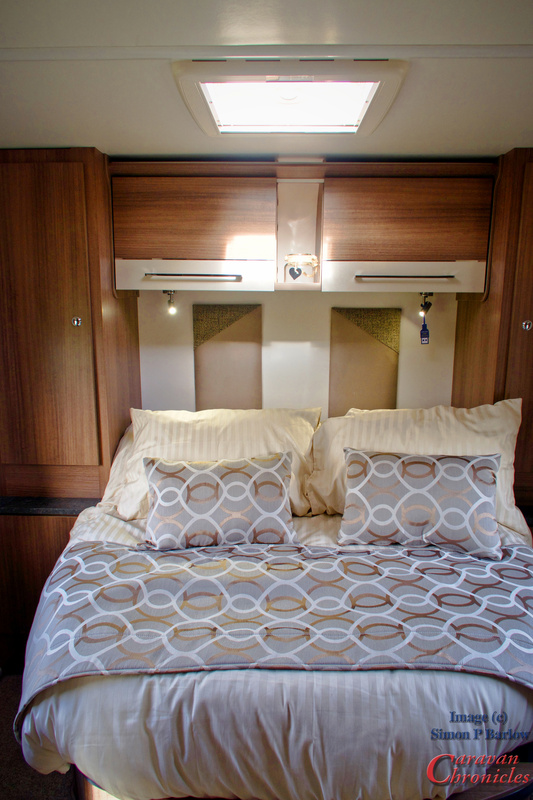 Now I do like this layout… it provides a ‘dinette’ area in a caravan without a dinette. The table can be slid rearwards towards the door on a sliding bar if you need more space on the seat across the front of the caravan. It does cover up the small seat near the entrance door though. However here’s my thoughts on it…. sitting using the table is a bit of a compromise. In order to accommodate under seat space for the electrics… there is a cushioned area against the wall that is not really a seat and that means it’s a bit tight on leg room. So for the person sitting near the door you are sitting right on the edge. The cushioned section under the tables also the support for the pull out bed slats that allow it to become to a double bed. The other thing is, a person sitting here doesn’t have a back rest, so don’t throw your head back for a hearty laugh at a joke after a glass of wine or two.. you might end up on the floor! The table as I mentioned earlier does slide sideways it doesn’t drop down. That means two people want to stretch out facing the TV (or where the TV can be accommodated) then it’s not happening. A bit of thinking could have sorted this out. Reversing the G so the table was on the same side as the kitchen would have allowed the side of the kitchen unit to become a back rest and maybe using the same sort of contrivance to drop the table to seat level as used when converting some dinettes into bed(s) and utilising the side and back cushions would still allow two people to stretch out facing the TV area. Like I said, I do like the new layout as it really opens up the functionality of the space and if you are just a couple, maybe you would not need the big table that comes with the caravan. All the models come fitted with mud/spray flaps to the wheel wells which I think is a welcome addition (it did get me thinking about adding these to our caravan!) and you have the option of going for Bailey’s wheel lock solution – which I do like, or if you want to stay with ALKO the chassis is still fitted with a receiver. 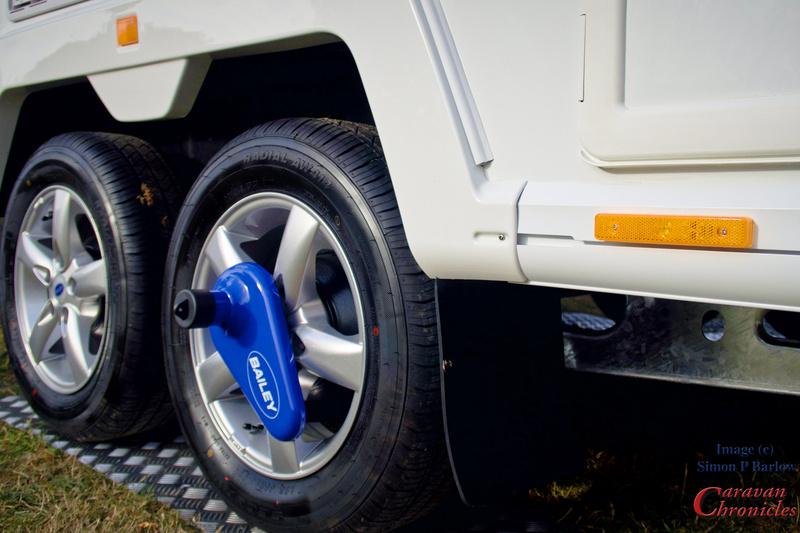 Bailey have opted for 185/R14C as a tyre size for the single axle variant and a 185/65R14 for the twin axle. 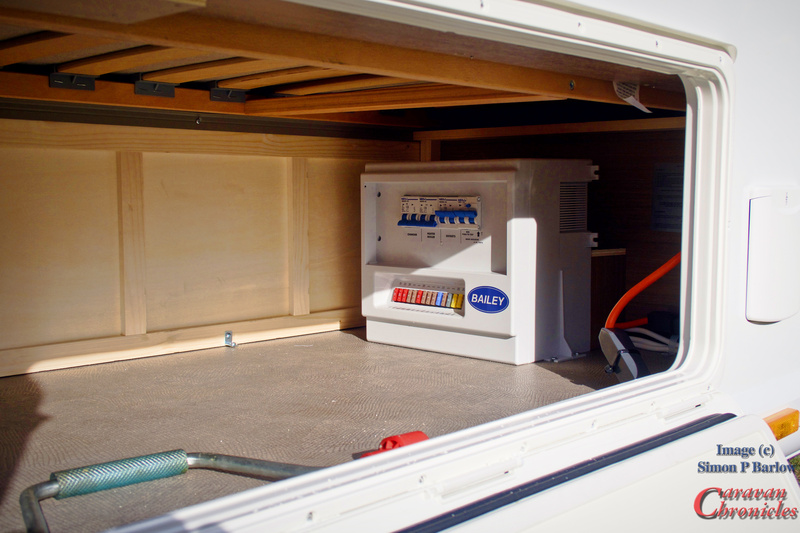 One thing that Bailey have mastered by moving the gas locker to the side is the ability to have a mahoosive storage area stretching across the front of the caravan. Although not a skier, I’ll be you could get a couple of pairs of skies in there. It does also make it easier if you have a wind break you can just roll it up and thread it in. I would like to have seem a little protection for the hot air ducting though. I get the feeling that might sustain a few dimples here and there. On the rear access on a couple of caravan there is a potential wrist slasher (go on, ask me how I know!) The pipe work has been secured by ‘zip ties’ across the front of the hatch. Maybe just getting the ties trimmed flush or the cut ends pushed down during assembly would be an easy fix. While we are on about LED lights… LED spotlights in particular, someone somewhere in a company that designs and manufactures light fittings for the leisure industry had an idea and thought it was a cracker. Put a USB socket in a spotlight. I too was similarly smitten with the idea. 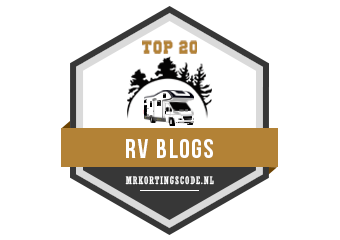 That was until I sat in our caravan and looked at all the devices – MiFi, two iPhones, two battery chargers, Kindle, iPad, Christmas lights (yes we have some that plug into a USB socket)…. if I plugged everything in it would have looked like an explosion in a spaghetti factory. Good idea, but not at the sacrifice of a couple of points at a sensible height and location. It might just be me. OK not a major one for me as I have about as much use for one as a certain Mr. Ditton… (we let our beards dry naturally… what did you think I was going to say!) The only time I use a hair dryer is when I want to shrink some tubing and I’ve temporarily unsure of the location of my hot air blower. But I do know that there are people out there that have requirements to use hairdryers for prolonged periods and I’m speaking up for them. 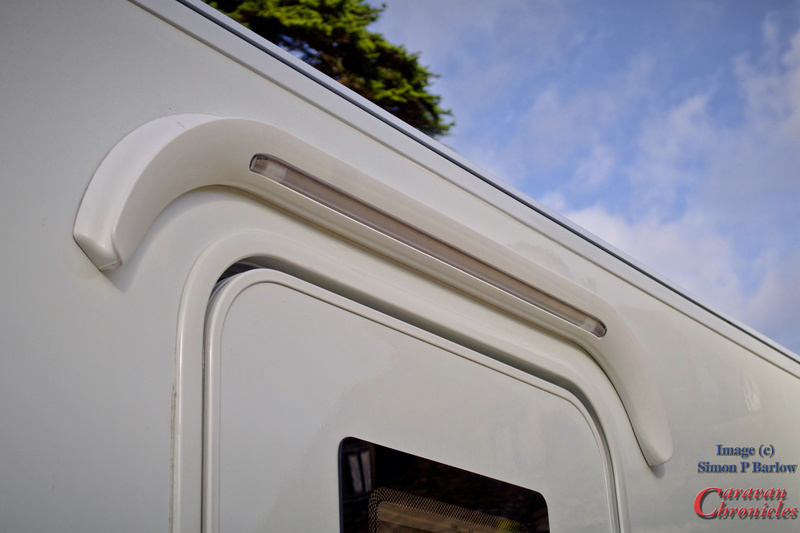 Ever since watching American RV videos, It has always struck me what a good idea to have an opening roof light in the shower… not necessarily to get rained on while having a shower (handy if the Aquarol is running low though), but to let the steam out when having a shower instead of watching it condense on any vertical surface in the caravan that are fractionally below body temperature. The shower head is one of the really excellent Ecocamel units… I have to say that a, because they are and b, we have one at home and one in our caravan. The shower tray is new too… well it’s new to me as I haven’t seen one like this before… so it may not be new… but it’s new to me. I like the fact that even if you are pitched on something slightly less level that a billiard table you stand a chance with deft squeegeeing (is that a word) you can get the all the water out before it has chance to escape anywhere other than intended. Surprisingly the wheel arch doesn’t intrude as much as I’ve seen on other caravans. The only thing I did spot is that one one of the caravans I think the chap that was responsible for dispensing glue on the installing the shower sides had gone to see a man about some cheap awning pegs… the sides of the shower were bowed a little and a gentle push popped them back agains the sub wall… release the pressure and they popped out again. It was only on one caravan (I went back and checked the others… so to anyone was there that thought I was a bit demented running in and pressing no the shower sides and running out again… that explains it). One thing that often happens is you launch a new range, and it steps on the toes of an existing range. Recently Bailey launched the new Phoenix which on the face of it overlapped heavily on the Pegasus brand. However Bailey have taken a leap forward with Pegasus Grande and moved into the ‘wide body’ (in aircraft parlance) platform which while not stepping on the toes of the flagship Unicorn, could be seen as enticing enough to draw potential Unicorn buyers away. I suspect the in the not too distant future there will be another announcement coming out of Bristol. Go and see the new Pegasus Grande at your local dealer… or better still visit the Caravan Show at the NEC 16-21 October to see the whole Bailey range. (I’ll let you into a secret…. they have redesigned their stand at the NEC). Right, I guess after 2000 words of waffle, that is if you are still here, you now know why I don’t do caravan reviews… and the memo will go round…”for God’s sake don’t invite him again”! A very good review and looks like Bailey have moved into the 21st century however a payload of 179kg is paltry. 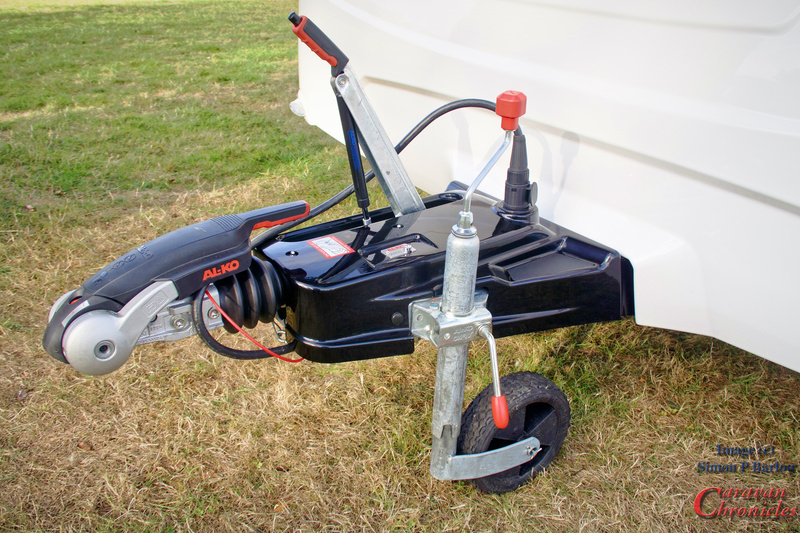 Once you add on a AWD motor mover at 60kg the payload is reduced to 119kg. An air con would eat up another 30kg and heaven forbid if you want a satellite dish. Why don’t any caravan manufactures take this into consideration? Manufacturers have a hard time with weight. On the one hand they want to give you as much payload as they can… big payload sells caravans. On the other hand they want to keep the MTPLM as low as they can so the caravan can be safely towed by the widest range of vehicles… to increase sales! 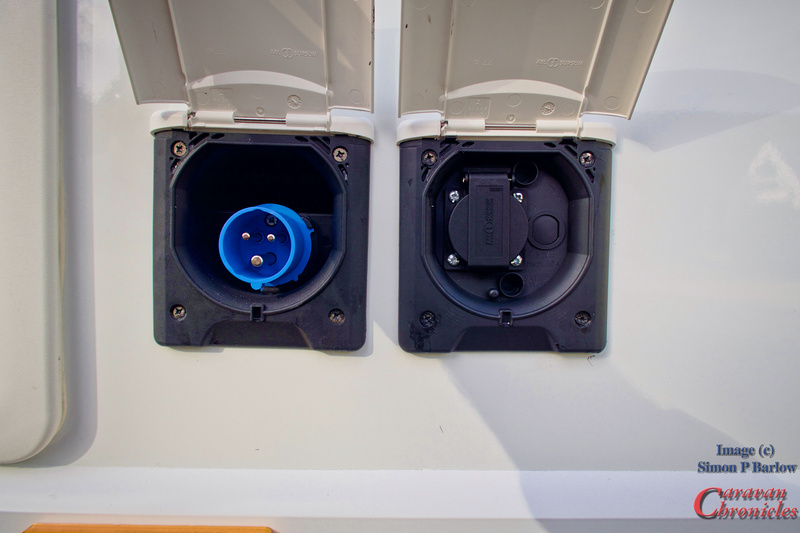 The Grande range is built on either 1600Kgs ALKO chassis for the single axle or 1800Kgs for the twin axle vans so there is always the option of upgrading the weight plate to increase payload capacity. Good report! Thank you , I wonder how long it will be before all manufacturers jump on the 8ft band wagon? I can think of a number of sites which we have visited where the additional width could be a problem . I have been thinking the same thing too. Our VW Amarok is a bit wider than a lot of tow vehicles and sometimes that is a bit of a squeeze to get the vehicle and a standard width caravan side by side on some pitches. 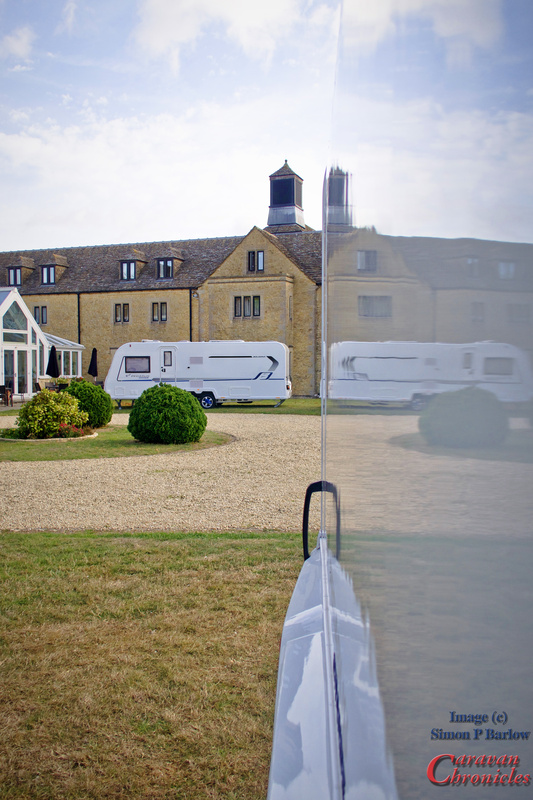 With the growing popularity of 3 metre wide awnings…. I think we might start to hear the collective “harrumphing” of wardens as pitch edges start to get damaged. At present we have a 2.45m Buccaneer caravan and we have never encountered an issue with any site that we have visited in Spain, France or England in the past 2 years. I’m sure that a lot of sites are eminently suitable for ‘wide body’ caravans. My thoughts are though that as we see more of these vans a lot of the older or smaller sites might potentially have some issues. 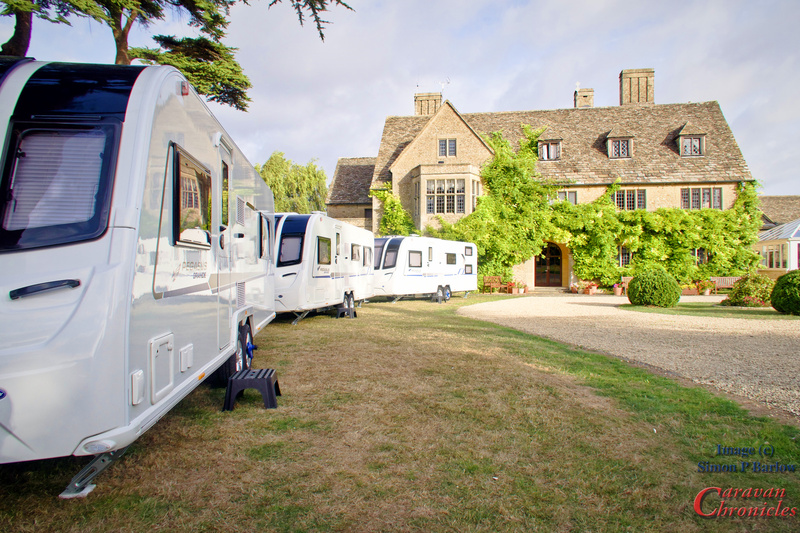 On a personal level though I’m all for ‘wide body’ if it gets more people into caravanning and enjoying the caravanning life. Beats airport queues every time.